Struffoli is a traditional Neapolitan Christmas dessert made from small puffs of citrus-flavored dough that are crunchy on the outside and soft inside. The fried balls are dipped in honey, dusted with multi-colored candy sprinkles, and usually served piled high in a tree-shaped mound or shaped into a wreath. Sweet Maria's Italian Cookie Tray presents sixty-five recipes for the delicious, festive cookies that brighten every Italian home, at the holidays and all year-round. Combine the flour, lemon and orange zest, sugar, salt and baking powder in the bowl of a food processor. Pulse to combine the ingredients. Add the butter; pulse until the mixture resembles cornmeal. Add the eggs, orange juice, vanilla and optional Fiori di Sicilia. Blend until the mixture forms a ball. Add a little more flour if the dough is too sticky. Shape the dough into a small rectangle, wrap in plastic wrap and refrigerate for 30 minutes. Cut the dough into 8-9 equal-size pieces. On a lightly floured surface, use the palms of your hands to roll each piece into a 1/2-inch thick log. Then cut each log into 1/2-inch pieces. ( An easy technique is to place all of the logs side-by-side and then use a knife or a dough cutter to cut through all of the pieces at once to form the 1/2-pieces.) You can leave the shape of the pieces as is or use the palms of your hands to roll each piece into a small ball. In a large shallow saucepan, pour in about 2-inchs of oil. Use a deep-frying thermometer to heat the oil to 370 degrees F. In batches, fry the dough balls until lightly golden brown, just 1-2 minutes. Transfer the fried dough balls to a paper towel lined plate to drain. In a saucepan, combine the honey, sugar and lemon or orange juice over medium heat. Bring to a boil and cook until the sugar dissolves, about 2-3 minutes. Remove the pan from the heat. Add the fried dough balls and stir until coated in the honey mixture. Allow the mixture to cool in the saucepan for 2 minutes. Spray the outside of a glass or small bowl with cooking spray and place in the center of a round platter. Use a large spoon to arrange the struffoli around the glass to form a wreath. Wet your hands with a little water if you need to help shape the struffoli into shape. 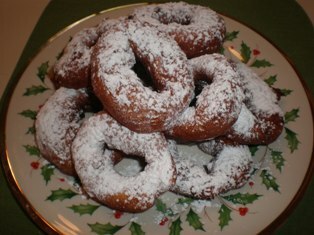 Alternately, you can mound the struffoli into a tree shape or simply mound them on a serving dish. Add the sugar sprinkles while the honey is still wet. Allow the mixture to set for 2 hours before serving. You can also make this one day in advance. Remove the glass or bowl from the center of the platter and serve.